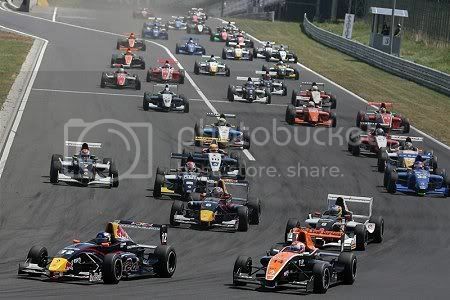 BUDAPEST, JULY 06 2008 – Once again, there was no limit on Daniel Ricciardo in this weekend’s third round of the 2008 Eurocup Formula Renault 2.0. With two pole positions and two wins, the SG Formula driver enjoyed a perfect weekend at the Hungaroring circuit near Budapest (HUN). The Red Bull junior driver again extended his lead in the championship with a record fourth victory out of the six races held so far this season. With a total of 77 points, Ricciardo has already built up quite a gap to the runner-up, his team mate Andrea Caldarelli, who has 58 points.